Comes with a Slip Clutch and Laminated Tailwheel. 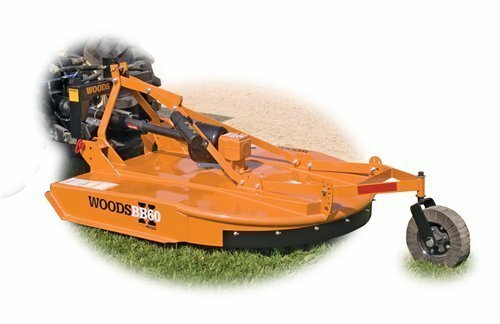 The new Woods BrushBull TM Extreme offers "extreme" features, making it the most relentless rotary cutter on the market. Designed for some of the toughest applications you?ll encounter, this BrushBull will impress you with incredibly reliable performance. And with the Woods name behind it, you know you?re going to get a great product with unmatched service and support. The BrushBull offers the discerning buyer many great features not found on other similar rotary cutters. The frame includes a 3-piece deck plate welded to two 3" x 4" structural beams running the length of the deck, plus a 2" tube used as a rear bumper. Our tail wheel is mounted at four points verses competitive units that only mount at 3 or even only 2 points. This gives us more strength and longevity, especially from side pressure during turning. Our quick change blade pin system and large access window on the deck top allows for easy blade changes without the need to get under the cutter. And our gearboxes are supported by an industry leading 6 year warranty. These and many other features make the Woods BrushBull rugged, dependable, and productive to meet the extremes of the real world.